The Clinicians Health Channel contains many databases and journal titles that are accessible to Barwon Health staff. These resources are provided by the Victorian Department of Health. Visit the Clinicians Health Channel website for more information and to register for offsite access to Clinicians Health Channel resources. If you prefer, you can use your Library login to access CHC resources at home - one less password to remember. Go to step 2 if already a Library member. If not, apply online then wait for your membership confirmation email. This is not system-generated and will therefore only be sent out during business hours. Membership details must be confirmed by Library staff before offsite access can be activated. After receiving the membership confirmation email, visit the Sign In page. Click the Set/reset password link at the bottom of the screen. 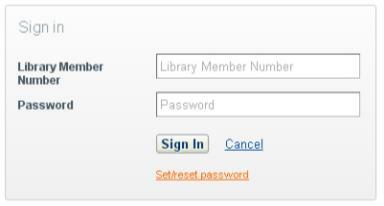 Then enter your Library Member number (your employee number) and click Request new password. After requesting a new password, you will receive an email containing instructions on setting your password. This is sent to the email address associated with your Library Membership. At work, most subscribed content is automatically accessible. At home however you will need to login. 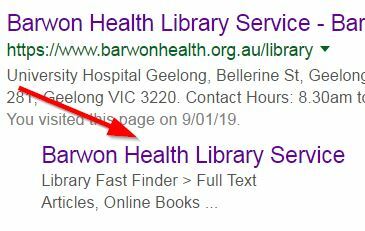 Firstly go to the Library site from home - just google barwon health library, and then click on the second link as below. Use the library site as you normally would and just login when requested.